Nothing is more crucial than a morning routine. Honestly. Since finding out about my new job, one of the major benefits was knowing I would have a set schedule. As an inpatient nurse, a set schedule is not something you are able to have. You work different days of the week, every week, and getting up any earlier than your 5:30am wakeup call to “do things” seems impossible. Most of my mornings were spent brewing coffee and laying on the couch until said coffee was completed, to in turn head straight to the shower. Off days were just as disorganized with no alarm set and once again waking to find coffee (maybe that’s just me though). This instability in morning routine, always made me a little sad given that prior to nursing school I was a morning person with a love for a good morning spent. As a result, as soon as I found out I would be joining the 9-5 life, I have been organizing and planning my new-found morning routine. Now, I have only completed this for a week now, but I am already quite enjoying its regularity and sense of peace it establishes in my day. For simplicity purposes I will be using a day where I workout versus not. 0530 – 0615: Workout. The types of workouts we do vary on the day. Most days I got to the gym for a class or personal training session. If not, I will run or walk. There is something so energizing when you get your workout done and out of the way before mot people even walk up. 0615-0630: Shower and eat breakfast. I shower while John makes breakfast. It works out quite well. 0630-0730: My favorite part of the morning. I have an entire hour to do whatever my heart pleases. I can read, write, meditate, play with Posey…probably a combination of all four though! John gets ready and heads to work during this time. 0730-0800: Get ready while listening to a podcast. 0800-0810: Pack lunch and head to work. 0810-0820: Drive to work. Yes, I live very close haha. So far, this has been working very well. On the days that I don’t workout in the morning, I can either sleep in until 0600 or get up and begin writing right away. I love having a stable routine though. It just puts me at ease and I love watching the rest of the world wake up. Mornings are my favorite time of day and for the first time in my career I am able to fully enjoy them. As I said before though, I am only a week in, so we will have to see if this routine works out in the long run! Love it Melissa! 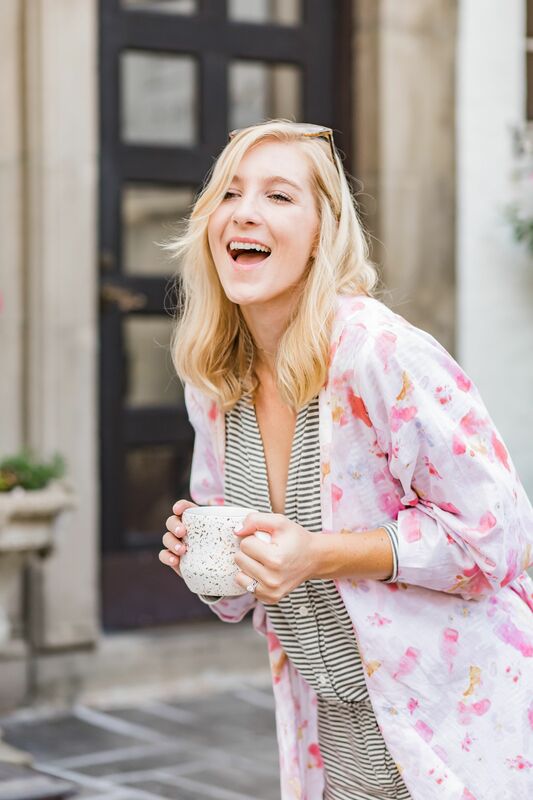 So happy for you in your new job that you will not only be crushing it with a morning routine, but also writing more for your blog!